Human and animal health, agriculture, energy production, environmental protection, and a host of other activities of interest to humans have something startling in common: the key to improvements in all of them is likely to require a significant computational component. As Darwin once said “Mathematics seems to endow one with something like a new sense,” and the powerful tools of mathematics are enabling those who are able to utilize this “new sense” to see connections, structures, and even possibilities that up to now have been invisible. What Darwin couldn’t have guessed is that the powerful tools of mathematics would be harnessed to extraordinary computational power, and that both would be needed to deal with the exponential increase in the volume of data coming from today’s laboratories and research institutes. The computational power itself is increasing at breathtaking rates. In our recent past, it took 30 years to determine the complete DNA sequence of a cold virus genome. Today a virus of the same size can be sequenced in minutes. We can now read more than 500x billion bases in a week, compared to 25,000 in 1990 and 5 million in 2000. “We are talking about exabytes [1018 bytes] of information,” marvels Leroy Hood, M.D., Ph.D., president and co-founder of the Institute for Systems Biology. Where are we going with our new ability to develop larger and larger amounts of data, while marrying this information with ever more sophisticated use of Darwin’s “new sense”? 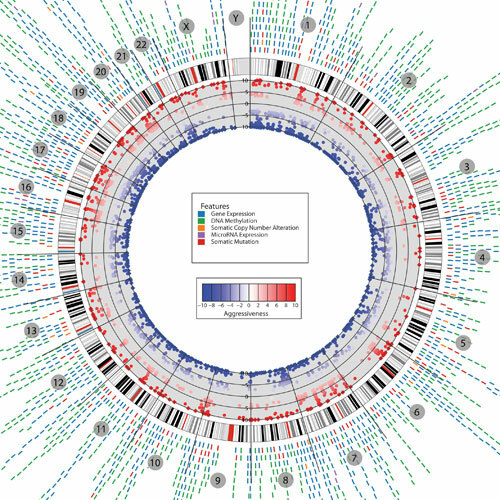 The CRC Aggressiveness Explorer developed at the Institute for Systems Biology allows researchers to visualize the molecular signatures associated with colorectal cancer. Each signature has a score indicating the statistical evidence for tumor aggressiveness. For Dr. Hood, the results are revolutionary and they were powerfully encouraged by the Human Genome Project (HGP). The premise of the Institute’s work is that diseases result from perturbations of biological networks. These perturbations can arise from biological changes, such as mutations in the information of the genome, or from environmental influences, such as toxins or bacteria. Disease-perturbed networks both cause and reflect the progression of a disease. Thus, diseases can be diagnosed, treated, and prevented by understanding and intervening in the networks that underlie health and illness. One of the Institute’s strong points is establishing the computational infrastructure needed to analyze the thousands and eventually the millions of human genome sequences that will become available over the next 10 years. These computational tools will enable large-scale comparative analyses of human genomes and their attendant molecular, cellular, and phenotypic data. Dr. Hood cites two ultimate objectives of systems biology. The first is the ability to predict the behavior of a system with its emergent properties from knowing what kinds of perturbations that are applied to it. The second objective is the ability to understand the system in sufficient detail so it can be redesigned to create completely new emerging properties. Like Dr. Hood, Franziska Michor, Ph.D., from the Harvard School of Public Health and the Dana-Farber Cancer Institute, also takes a computational approach to biology. Her focus is oncology, and as with Dr. Hood, mathematics allows her to see relationships that yield results never before achieved. Dr. Michor goes on to say that while we do have drugs that are effective in treating cancer, these drugs also exert a powerful selective force on the cancer cells. As with any organism under severe evolutionary pressure, some members of a cancer cell population may acquire molecular changes that strengthen the clan’s chances of survival. The result: drug-resistant cancers. Dr. Michor’s research involves learning ways to administer the drugs differently so resistance doesn’t arise. “We can make a mathematical model that allows us to study the evolution of resistance cells and then we can use this mathematical model to identify treatment strategies that prevent or delay resistance,” she says, adding that she does this by looking at acquired resistance as a problem in evolution. Mathematical modeling works well for modeling evolutionary processes, and such modeling can provide otherwise-invisible insights into the biology of cancer. To study the evolutionary dynamics of resistance under time-varying dosing schedules and pharmacokinetic effects, the populations of sensitive and resistant cells are modeled as multitype nonhomogeneous birth–death processes. The drug concentration may affect the birth and death rates of both the sensitive and resistant cell populations in continuous time. This flexible model allows Dr. Michor and her colleagues to consider the effects of generalized treatment strategies as well as detailed pharmacokinetic phenomena such as drug elimination and accumulation over multiple doses. Computational tools enable them to develop estimates for the probability of developing resistance and the size of the resistant cell population. With these estimates, they are able to optimize treatment schedules over a subspace of tolerated schedules that minimize the risk of disease progression due to resistance. In addition they can locate ideal schedules for controlling the population size of resistant clones in situations where resistance is inevitable. This evolutionary mathematical modeling approach in cancer treatment will soon be in clinical trials. Dr. Michor believes that the ability to design optimal treatment strategies for preventing drug resistance may increase the benefits of therapy for many different cancer types. Meanwhile, Dr. Michor is surprised by the resistance in the oncology community to mathematical techniques. “In physics or economics, it’s key to use math. In cancer research, while using statistics is accepted, it’s not a well-accepted idea to use math to see the underlying framework,” she points out. Dr. Michor suspects that oncology has not drawn many mathematicians because there are as yet few examples of successful applications in cancer biology. Odds are that with research like Dr. Michor’s, this will change. Eric Lander, Ph.D., director of the Broad Institute, also takes a highly mathematical approach to investigating biology. “Mathematics is now at the heart of biology,” he states, and his approach is helping pioneer new ways to understand the basis of disease. The trillions of data points he and his colleagues at Broad are developing come from: mapping and sequencing human, and other genomes; understanding the functional elements encoded in genomes through comparative analysis; understanding the genetic variation in the human population and its relationship to disease susceptibility; understanding the distinctive cellular signatures of diseases and of response to drugs; and understanding the mutations underlying cancer. Among the surprising discoveries is the fact that “the majority of the functional sequences in the human genome encode regulatory elements that we had been completely blind to. They emerge from cross-species comparisons.” In addition, these discoveries have revealed that thousands of genes don’t code for proteins. For Dr. Lander, the ultimate goal is for sequencing to become so simple and inexpensive that it can be routinely deployed as a general-purpose tool throughout biomedicine. To fulfill this potential, the cost of whole-genome sequencing will need eventually to approach a few hundred U.S. dollars. Mathematics, with the help of increasingly fast, powerful, and cost-effective technologies is providing us with an ability to see what have up to now been hidden patterns of life. These mathematical insights provide powerful new approaches for understanding disease mechanisms, pioneering new diagnostics techniques, and rethinking how drug targets should be chosen. Today’s use of Darwin’s “new sense” is laying the foundation for addressing in ways never before possible many of the serious societal problems involving biologically based systems.